As you may have noticed from many of the recipes I post, I’m a big fan of meals that can be prepared in 30 minutes or less. Many of you tell me that you’re so busy, you just don’t have the time to cook. This often results in lots of deliveries, takeouts, drive-thrus and less than optimal food choices. I totally get it. On some nights, even I don’t feel like spending a lot of time in the kitchen. After a long day at work (and a stop at the gym), sitting on the couch watching TV, or surfing the Net can sound A LOT more appealing than start chopping, sauteing, etc. But since preparing your own food is key to get (and stay) healthy; it’s important to have some quick and easy recipes to rely on when you’re in a hurry (or too lazy), but still want to make yourself something delicious. Which brings me to this Mongolian beef. First off, don’t be fooled by the name, as aside from the beef, none of the ingredients or the preparation methods are drawn from traditional Mongolian cuisine. 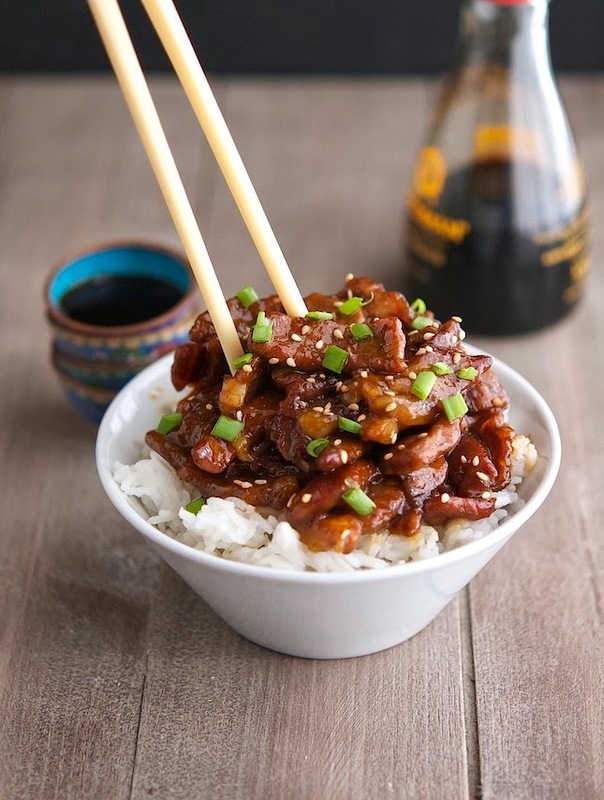 In fact, this dish is typically served in Chinese-American restaurants (first and foremost, PF Chang’s); and it’s basically sliced beef stir-fried in a savory brown sauce. Easy. I think I’ve made this dish 100 times now, and I feel like this is one of those recipes that you just can't mess up. Each time is amazing no matter how slightly you tweaked it. Lately, I’ve mastered this gluten-free/paleo-friendly version that has definitely become my favorite. Full of delicious flavors that just pops, it's a wonderful dish for an impressive weeknight meal. All in all, a fast, no frills recipe that always delivers. 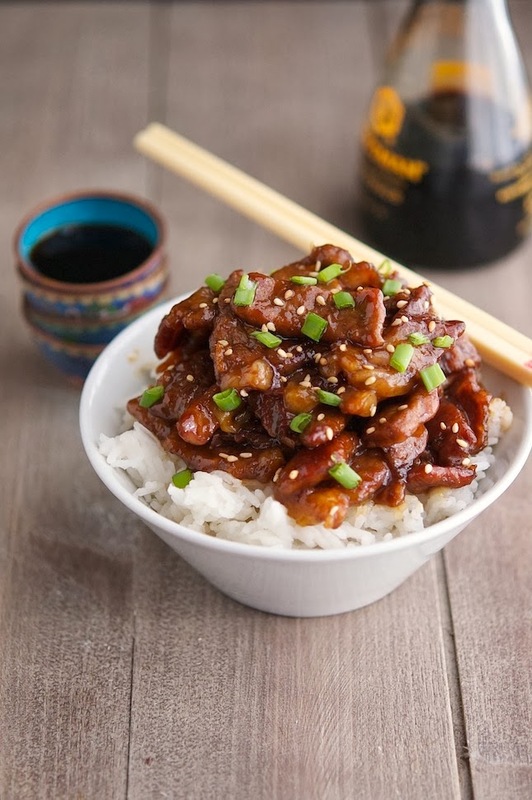 Like my friend John said after tasting it the other night: "OMG, I think I've died and gone to Mongolian Beef Heaven"
Mongolian Beef (Low Carb & Gluten-free) Print this recipe! Heat two teaspoons of olive oil in a saucepan over medium heat, add ginger and garlic and saute’ for 30 seconds; quickly add the soy sauce (or coconut aminos) and water before the garlic scorches. Add sugar (or honey) and red pepper flakes (if using); raise the heat and simmer for about 3 to 4 minutes, until the sauce thickens. Combine beef stripes and arrowroot powder in a ZipLoc bag (or in a shallow dish) and toss until all beef stripes are evenly coated. Heat remaining 2 tablespoons of olive oil in a large frying pan (or wok), until it’s hot but not smoking. Add beef and saute’/stir-fry for 2 minutes until it begins to darken around the edges, stirring every now and then so that it cooks evenly. Remove the meat from the pan and clean the pan (be careful though, the pan is hot!). Return the pan back over the heat, add the meat and simmer for one minute. Add the sauce and cook for one minute stirring constantly. Add the green onions and cook for one further minute. One serving yields 436 calories, 15 grams of fat, 24 grams of carbs and 23 grams of protein. Okay, you have done it again. YUM!! Definitely have to try this one. The orange chicken was amazing. Let me know how you like it Lauren! This looks fantastic Mike, can't wait to try it! Loving all the Asian-inspired recipes you've been making lately. I'm always looking for another recipe to add to my quick dinner repertoire because as much as I love to cook, some days I just don't want to be in the kitchen very long! Quick and easy recipe make life so much simpler, it's always nice to have a couple of solid ones up your sleeves! YUM! I love Asian food. I'll have to go check out your other recipes - someone said orange chicken?!?! My struggle with making Mongolian beef is always getting the beef sliced thinly enough. It's easier if you pop it in the freezer for 10 mins or so to firm up first. So very true Ashley, either you own a very sharp knife (like myself) or freezing the meat makes it much more simpler to slice it thin. This is going to happen for dinner tomorrow, can't wait! Mike - with all your healthy makeovers of Chinese dishes,you could open up your own restaurant! I am not a huge fan of beef- but,good gosh, seeing your mouthwatering dishes, I wish I was! Opening a Chinese restaurant you said? I'm not sure I'll be up to the task but thanks for the vote of confidence! I couldn't agree more with you, so many delicious dishes so little time to prepare them! Awesome Maria, I'm so glad you liked it! Wow this looks so incredible! The Mongolian Beef at PF Changs is awesome and I'm super excited to be able to make a version at home! 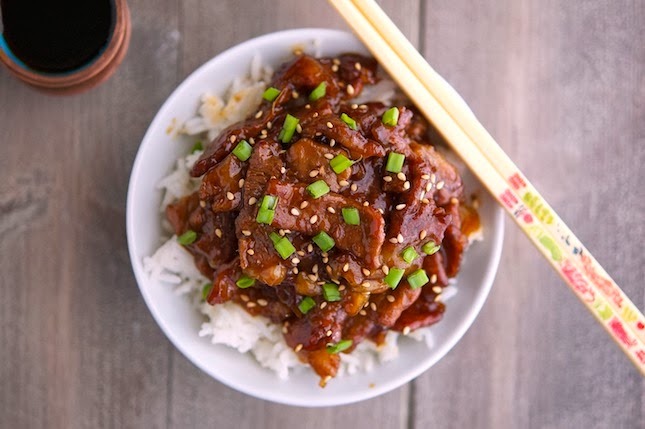 It's really perfect for a weeknight meal... super quick and maximum flavor. Love it! I love quick and easy recipes like this one! Between school and marathon training, I never find the time to cook a decent dinner. But you bet I'm trying this one. It looks amazing! This is perfect for a post marathon training dinner! How is this classified "low carb" at 48g of carbs? Its a typo that still exists 2 years later and shows up as a low carb recipe on Search Engines... It isn't condescending to alert you of something that is incorrect in your blog title. Agreed. People looking for low-carb see that high carb count and dismiss as a a recipe (set) from someone who doesn't even know what low carb means. Instead of being defensive about your mistake, apologize and fix it. simply swap the honey or coconut sugar for your favorite substitute people!! So when are you going to come over and cook for me? Oh wait, have I asked you this before? ha ha. Every time I stop by, it reminds me of how you have yet to knock on my door with some grocery bags! 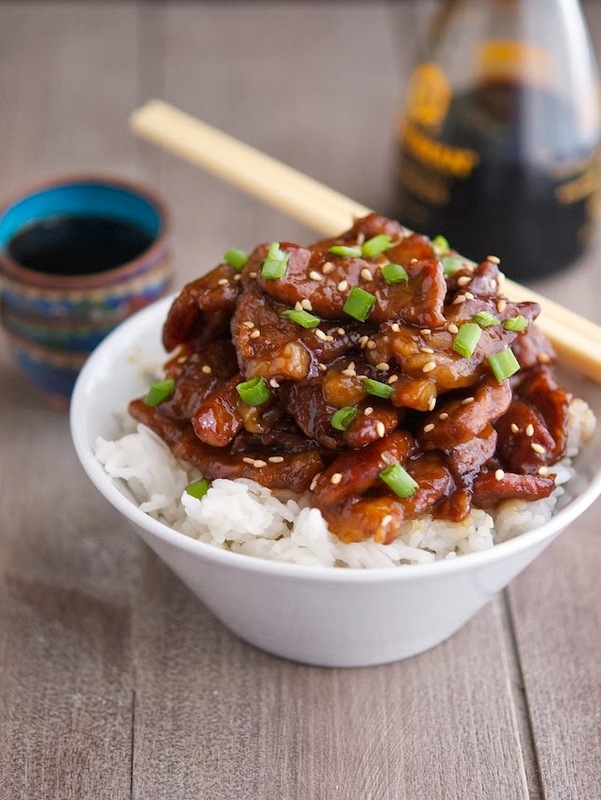 I am a big fan of this dark soy sauce dish, your dish is a perfect one. I will try this one out with chicken. Awesome Ash, let me know how it turns out! Hi Mike, your are an excellent cook. This is really wonderful and very impressive photography skill. 2 thumbs up for you. Absolutely mouthwatering - seriously loving your Asian remakes! Sorry, second half of my comment it this tastes so delicious and it's really easy to make! I really enjoyed this recipe for dinner tonight. I did want an additional vegetable, so I added some julienned red bell pepper. Thanks so much for the recipe! Can I use cornstarch in place of the arrowroot powder? Can you use ginger in powdered form? And if so, what would be the conversion in tsp/tbsp.? I would use about 1/2 teaspoon of ground ginger! This dish is delicious! I did use cornstarch and organic raw sugar instead of the arrow root and coconut palm sugar since I had a hard time finding the correct ingredients . I can't wait to make it again! Thank you, C.A. Hey Ash! What about the rice? Any recepies you recommend as a side? I made Martha Stewart's Coconut (milk) Rice, YUM! In a medium saucepan, combine 1 1/4 cup rice, 1 can Full-Fat coconut milk, 3/4 cup water, and 1/2 teaspoon salt. Cover and bring to a boil; reduce to a simmer, cover, and cook until rice is tender and liquid has been absorbed, about 25 minutes. loved it! included lots of veggies like carrots, Asian greens, enoki mushrooms, and onions to bulk it up. Could add noodles as well. It was so delicious, looking forward to trying your other recipes too. thank you!!! ...either that or you've got the macros wrong, or are using impact carbs only? This was tasty, I'm loving substituting sugar with honey it just gives the flavour a bit more depth. I did alter the method slightly as I'm bit lazy ... Cooked beef first in batches, removed from pan and then made sauce in same I cleaned pan then just chucked beef back in. Thanks for another tasty meal. could you use truvia instead of the sugar in this? I am soooo wanting to make this tomorrow night for dinner! Tried this recently, it was excellent! I substituted with swerve and skipped the arrowroot stage. I instead added xantham gum into the sauce before removing it from heat. It was just as good (if not better) and definitely healthier than if I ordered takeout!